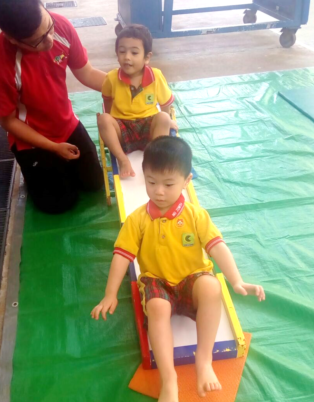 Chows Group addresses both gross motor skills, which strengthen the large muscle groups of the body, as well as fine motor skills, which include the smaller finger and hand muscles. Children are prompted to climb, jump, hop and run on the playground to strengthen their leg muscles. Two-year-olds don’t realize they are bolstering their fine motor skills in the Creative ArtsRoom, but they do know that they are having fun finger painting, making collages, coloring with sidewalk chalk and creating with clay.